The KONG Wet Wubba is a quick-dry water toy for your dog, ideal for fetching games in the water. The Wet Wubba is a KONG water toy. It is covered in neoprene (wetsuit material), which floats well. 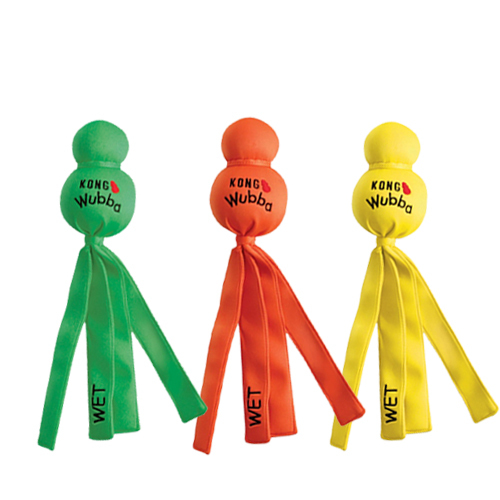 The Wet Wubba dries quickly and is also suitable for pulling and fetching games. This product is not suitable for prolonged chewing. The KONG Wet Wubba is available in two sizes, Large (approx. 34 x 8 cm) and Extra Large (approx. 43 x 10 cm), and in three colours (orange, green and yellow). You cannot select a colour, this product is delivered at random. Have you used KONG Wet Wubba before? Let us know what you think about this product. Good quality, quick drying our dog loves this for playing in the swimming pool with it.